Each year, thousands of catering and event professionals take to the floor at the award-winning Catersource Tradeshow, during which the industry’s best showcase delicious food, innovative products and solutions for caterers, event planners and the like. This year, our president & CEO, Donna Hansbury, director of marketing communications Chelsey Tupper and marketing communications manager Alyssa Zekoski had the pleasure of unveiling Ideaworks’ own innovative solution at the tradeshow, held in Las Vegas, NV, in February. At the show, Donna, Chelsey and Alyssa introduced our powerful new catering marketing platform, gemworx, to eager show attendees. Donna’s brainchild, gemworx was built with a deep understanding of the catering market, as Ideaworks has a longstanding history of creating marketing collateral for this industry and an understanding of the unique challenges event professionals face. Gemworx is a powerful, subscription-based online marketing platform built for caterers of any size that will officially launch in April. It is designed as an innovative tool that affords caterers the ability to create customized marketing collateral and event materials in a matter of minutes. Subscribers simply select a design from an extensive collection in the gemworx library, then customize the content with their own logo, photos and the like. Caterers can then download PDFs of their collateral or place an order for printing. 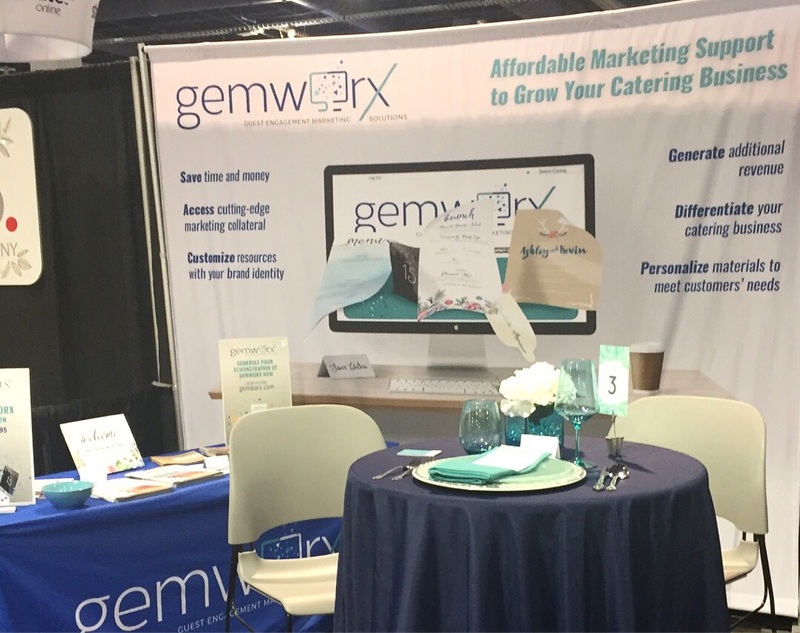 What does a gemworx subscription give caterers access to? 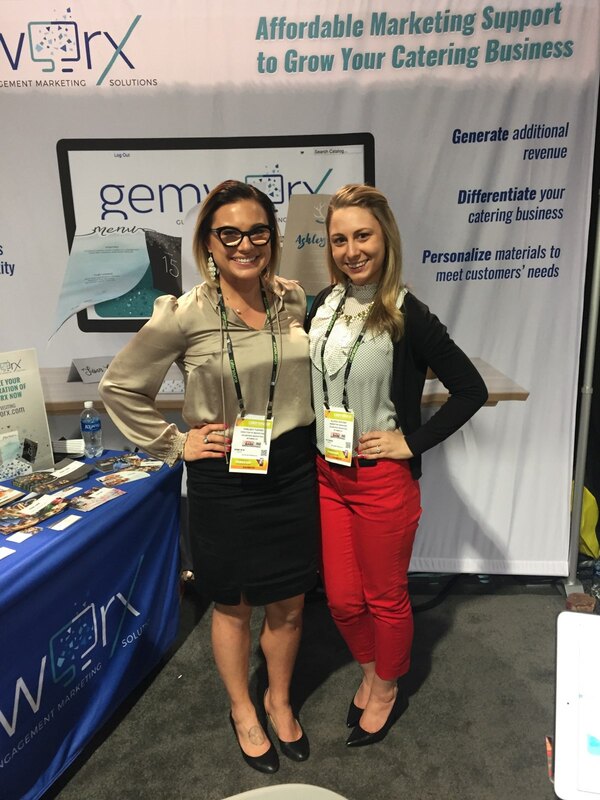 In the months leading up to the tradeshow, gemworx preparation drew our team even closer together, as each and every Ideaworks employee was actively involved in seeing to it that tradeshow materials and gemworx collateral were properly written, designed and delivered – all with industry trends and best practices in mind. When it came time for Donna, Chelsey and Alyssa to depart for Las Vegas, our team was confident that the hours put in would be worth it, bringing back new leads and exciting opportunities to grow our business even further. And they found that their beliefs held true. 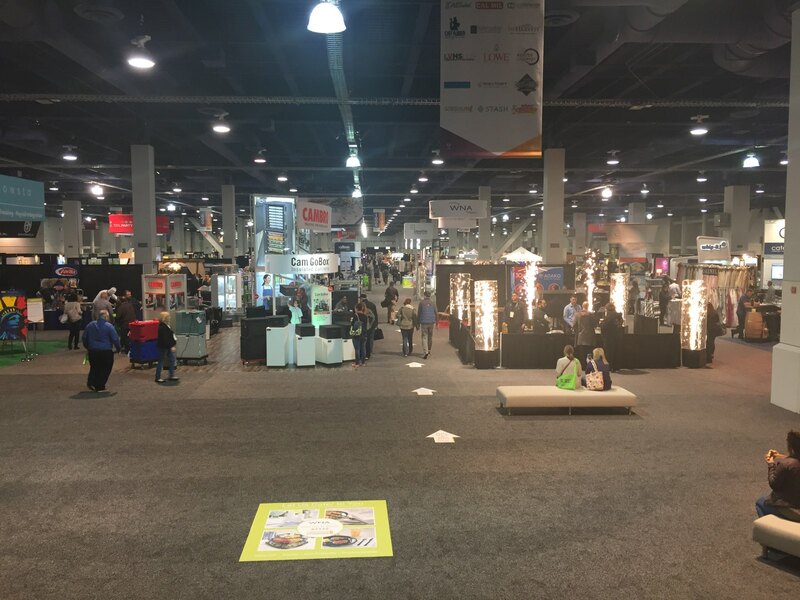 The hustle and bustle of the tradeshow floor was invigorating, and Donna, Chelsey and Alyssa spoke with a number of interested caterers and event professionals who expressed genuine interest in obtaining gemworx subscriptions once the site officially launches. Many have already scheduled demonstrations to understand the platform’s full capabilities. Attendees also offered valuable feedback and suggestions for other resources that we have since added to the gemworx portfolio. “It was fascinating to unveil gemworx on a national level to some of the most distinguished caterers and special events professionals in the indu stry,” remarked Donna. Among other highlights, the team was able to enjoy an array of delicious cuisine on the tradeshow floor while also networking with other industry professionals. “It was an excellent opportunity to better understand the catering world,” Alyssa said. This will only help to make gemworx even more successful in the months ahead. Click here to schedule a demonstration and see what gemworx can bring to your catering or event business.